This is such a fun topic! There are so many ways I keep the Disney magic alive at home. 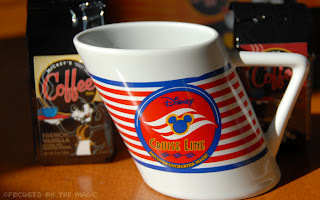 Narrowing it down was tough for me because it really has become my lifestyle to include Disney music, clothes, movies, even my morning coffee in a favorite Disney mug keeps me focused on the magic. If I had to choose just one for today, it would be cooking. I bet you were all thinking I would say photography, and you would be right but I also really enjoy food, cooking it, eating it and photographing it. 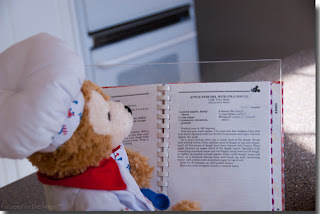 Collecting, reading and posting recipes here on the Focused on the Magic Disney Food page keeps the Disney magic alive. The recipes are from my Disney cookbooks, resorts and cruises. If we taste something really delicious in a restaurant I'll ask our server if they have a recipe card for the dish. Quite often they do and if not I know I can always contact Guest Services for the recipe when I get home. Before I call I'll scour the Internet and my cookbooks. Most times I follow the recipes but I do like to adapt them to my families way of eating. Peter is lactose and wheat intolerant, and everyone has a like or dislike of certain spices or foods. To accommodate everyone, I'll change it up and make the recipes our own. Browsing recipes for dinner and dessert ideas is a favorite pastime of mine. My cookbook collection is now well over 60 books so I always have lots of recipes to read. The Disney cookbooks are my favorites and my latest addition is always at the top of the reading pile. On our last trip we had the great pleasure of attending a few cooking demonstrations by renowned chefs at the Food & Wine Festival. 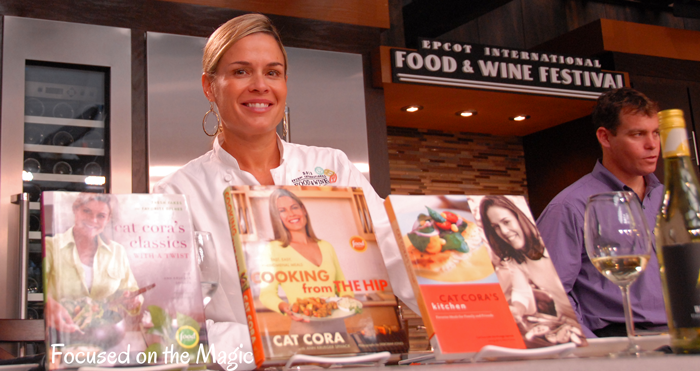 Two that stand out were "Iron Chef", Cat Cora of Kouzzina by Cat Cora® and Chef Robert Cordoba, Cape May Café, Disney's Beach Club. Sometimes chefs get very technical and introduce techniques that are way above my skill level. I enjoy hearing them and learning but it kind of turns to white noise after awhile. Both Cat Cora and Robert Cordoba demonstrated recipes that were easy enough for any skill level and are great additions to my Disney recipe collection. I was so thrilled with the demonstrations and wanted to bring home the Disney cooking magic to my kitchen, I purchased Cat Cora's Kitchen: Favorite Meals for Family and Friends cookbook which she told me was probably the easiest of all her books. I think these recipes will be good for our every day meals not just special occasions. I'm really looking forward to trying the Seared Shrimp with Spiced Hummus and Peppedew Relish that was part of the demonstration. Somehow, I don't think my plating (not exactly my forte) is going to look like this but hopefully it'll taste as good. After Thanksgiving we'll be making the Turkey and Craisins Salad recipe that Chef Robert Cordoba demonstrated for us with our turkey leftovers. 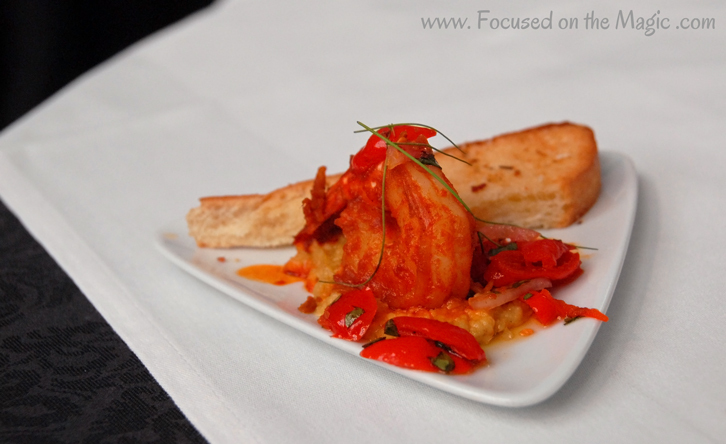 This was DS, Peter's favorite demonstration at the event and a recipe I think he'll enjoy making with me. It'll be such fun to reminisce about our magical Disney Food & Wine trip while we cook and eat. So, there you have it, a taste of how I keep the magic alive at home. How do you do it? Great post! A friend found that Cooking with Mickey cookbook for me at a used book sale. I thought it was so sweet of her to think of me! I also happen to know that someone will be gifting me with a Disney cookbook for Christmas. That's a collection that I seriously need to start. I have a TON of cookbooks, but I need more Disney ones! Yes, you can never have too many Disney cookbooks! 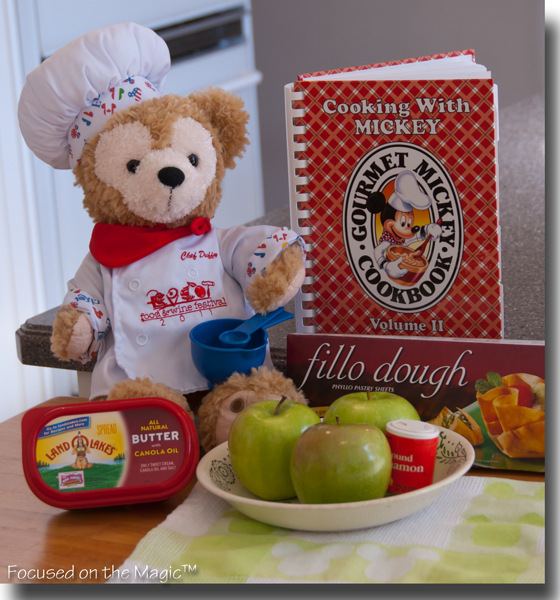 My Cooking with Mickey Cookbook has gotten a good workout, especially the desserts...Yum! What a YUMMY post!! Love recreating Disney Magic through cooking!! It was good to see you had help in the kitchen, Duffy really is a great pal :). But you got me hungry, what a great way to keep the magic alive! !